We sure enjoy your column, but in an earlier one, even though you gave a very thorough answer about 12-volts DC troubleshooting, you forgot one thing. That is to check the male and female connectors hooking a towed car to the motorhome. Several years ago I had similar troubles and the wires in the connectors were all broken and shorted due to moisture and dissimilar metal corrosion. The wire was copper and the connector lugs were steel. I replaced the connectors with ones with copper lugs and packed the internals with grease. Worked great! I do have an electrical problem I would like your advice on. One of the two battery disconnect solenoids isn't working anymore. The switch has six terminals on it and each has a wire connected to them. 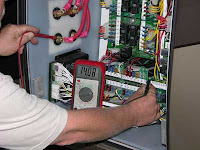 The solenoid is almost impossible to see let alone get a multi-meter connected. Do you have any suggestions on how to determine which is bad, the switch or the solenoid? Jim, thanks for the comments on that earlier question; good additional information for our readers. Now, onto your issue. Assuming you have an Intellitec battery disconnect system, my first inclination is that one or both of the fuses on the solenoid is blown. There should be two fuses mounted on top of each battery solenoid and it appears it's time to check them for continuity. Although you have indicated difficulty in accessing the solenoids, you should be able to feel for the fuses in order to remove and check them. Since you can't readily see or access the solenoids, you can attempt to troubleshoot the problem from behind the switch panel. Turn both switches to the "use" or “connect” position. Since you did not indicate which solenoid was not switching, try the following. If the coach battery is not switching, check for 12-volt DC between the white and brown wires. If the problem is with the chassis solenoid, check for 12-volts between the gray and purple wires. If you have a nominal 12-volts present at these wires but the solenoid is not switching, then there is either a wiring or connection problem, or the solenoid itself is faulty. If you have no voltage at either of those two sets of wires, there is a problem with the switch or control board. If this is the case, turn off the switches and swap the wiring between the two switches, one at a time, being very careful not to mix up the wire positions. Hint: Label each one before removing them. Turn the switches back on and check to see whether the solenoid that wasn't working is functioning now. If so, you have a faulty switch. If the same solenoid still doesn't work, then the solenoid is faulty and needs to be replaced. Any other problem would likely indicate a problem with the control panel itself. Remember to return the switch wiring to their original positions.